Excellent topic for discussion @hw621 ! I favour doing this...with a massive proviso: By the right government in QP and overseen by transport experts, not politicians. Can this/could this be a success? Absolutely, a huge one, many world class cities and regions have done this, continue to do it. But I have absolutely no faith in the present regime, or indeed, the present legislative basis (Muni Act and derivations, like the Toronto Act, etc, Metrolinx Act, etc) to enable this in a way necessary to have it succeed. I gave thumbs up to every post here so far not as a thumbs up to the proposal, but thumbs up to the eagerness to point out the follies of doing this wrong. As much as I support the concept, I'm terrified of giving morons a weapon to destroy us all with. One would have thought that roads and transit would have been big items in the October election. Don’t get me wrong, roads and transit were mentioned in brochures and at the public meetings but when you drilled down to the promises, there were no new policy directions to achieve better roads/transit service and no new goals to achieve better interconnections for that combination. This writer can’t recall many candidates talking about Metrolinx and the Hurontario LRT. Metrolinx, the agency that plans, builds and funds major transportation corridors in the GTHA corridor, has a plan that, for now, doesn’t include Brampton in rapid transit. One would have thought that some debate on that issue would have been important! Brampton city council bickered about the route, for almost two years, forgetting about the concept! The Toronto Region Board of Trade (TRBT) says that it has a better solution for transit. The TRBT wants the province to consolidate all the transit authorities and transit entities, in the Toronto Waterloo corridor; under an authority they call Superlinx … a creation of the provincial government. Superlinx would control all transit lines under a unified authority avoiding jurisdictional disputes and it would manage procurement, logistics and personnel along with a single integrated technology solution for the whole region. Superlinx would transfer the cost of running transit systems to the province so municipalities could skip out paying their 1/3 costs for new equipment, facilities and operational costs. The saved transit dollars could fund other local commitments. Still no one gets off scot-free! All transit related properties would now become the property of Superlinx and zoning would be allowed for either commercial or residential high density purposes to pay for transit operations. The TRBT’s Superlinx sounds like a good idea. But is it? It certainly takes the heat off the City of Toronto by merging TTC with Superlinx … saving capital and operational dollars. But Superlinx transit solutions may not fit in with Toronto’s official plan or reflect urban ideas, mindsets or viewpoints peculiar to Toronto and other urban areas. The Superlinx board of directors, provincially chosen, will be carefully screened to ensure they are in sync with provincial goals. That’s the whole point of the exercise ... local control would be forever gone! The TRBT doesn’t see the link folks have with their transit systems. Superlinx could become more than just a super transit agency; it could become a faceless bureaucracy that may make the trains run on time but have little care for the rider on the train or the persons living beside the track. Superlinx seems to be an idea worth pursuing but there needs to be a lot more thought put into the details before any transit property goes anywhere. The concept of a regional transit system isn't bad per say, but the Government of Ontario isn't the governing body that should be managing it. Ontario has consistently been an unreliable partner when it comes to funding transit expansion and operations (including the operations of their own GO Transit services), and Queen's Park has shown little willingness to work with municipalities. I have no doubt that "Superlinx" would quickly precipitate a gutting of transit services across the region. A recent proposal by one of the country’s largest chambers of commerce to put many of the region’s transit agencies under one roof is something that should be seriously considered, Guelph’s mayor says. Late last month, the Toronto Region Board of Trade issued a report arguing that municipalities in the Toronto-Waterloo corridor should upload all of their public transit that would be operated by a newly created provincial agency. Guelph Mayor Cam Guthrie says the idea of putting all of the area’s transit agencies under one roof is one that cities and towns should look at. “There’s something to be said about a greater conglomerate of transit systems within a region being run in a way that is involving local stakeholders from other municipalities, but perhaps the decision-making is something that needs to be more so done with data and not so much on emotion,” he says. Guthrie went on, saying the notion of having a central body making decisions, based on facts and figures, is the way to go. “Transit has always been something that needs to have greater foundational decision-making, immersed in a lot more metrics and data and business cases, not so much on ideology or politics,” he says. 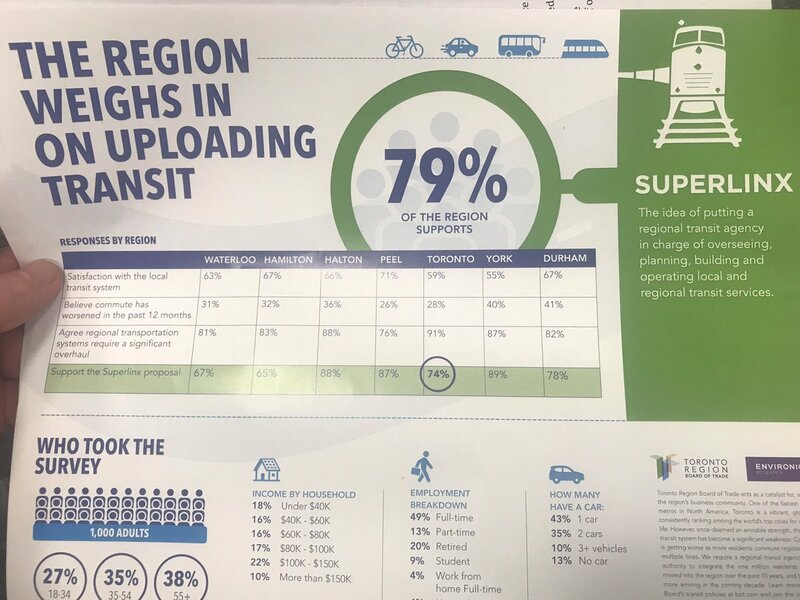 Another thing the Superlinx proposal could help solve, Guthrie says, is the number of cars on the road, as an interconnected transit system could encourage more people to trade in their car keys for a bus pass. “There is a lot of regional movement of people, for people looking at jobs coming into Guelph or leaving Guelph, and trying to reduce congestion on the roads,” he says. However, not everyone sees an amalgamation of the region’s transit authorities as a good idea. Steve Petric, who sits on the city’s transit advisory committee, says he believes an agency like Superlinx would be too big for its own good. “The proposal is a bit much. You lose local control with a big group like that,” he says. The idea of merging the transit agencies for Guelph and Waterloo Region, or at least having a co-operating relationship is not a new one. In the Transit Growth Strategy, released in 2010, Dillon Consulting recommended establishing inter-regional transit in the area, saying “a first stage to developing these higher order inter-regional services might involve linking conventional and paratransit services of Guelph Transit and Grand River Transit.” While the report recommended introducing this service in the second year of a five-year plan, it was not done. Mayoral candidate Jason Blokhuis also pitched the idea during the 2014 municipal election. Petric says Guelph Transit and its riders would stand to benefit by joining forces with Grand River Transit due to the latter’s size. “GRT is a bigger organization, they have more resources, whereas Guelph Transit will never have those resources due to the size of our city and transit system,” he says. Another idea Petric says the city should not pursue is privatizing the city’s buses. “There’s enough out there in terms of evidence that privatization would be a bad idea, because they’re just after profit and people would suffer,” he says. Guthrie, however, says he would at least take a look at privatization in the future, and not immediately discount it. Next year, the city is set to complete a business service review of its transit services, with all of the agency’s processes being put under the microscope. “The pilot review will look at alternative service delivery methods as well as improvements to the effectiveness and efficiency of the service,” the 2016 report recommending the review reads. “The review will include all critical functions of transit, including scheduling, planning, administration, resources and service delivery. Every "world class city" has a regional authority of some kind. Pretty much no city that has a system we aspire to (New York, London, yada yada) has but a single system for the core municipality and certainly no one is traveling from abroad to study Toronto's system and de-amalgamating what they have because they've realized managing a single commutershed is a silly, obsolete idea. There are all sorts of different models, with different pluses and minuses. Metrolinx is a baby step at best. To qualify they'd need a totally different board, including local government representatives, and independent governance from the province (they're currently entirely at the whim of Cabinet) and independent funding. Then they can talk about how to manage uploading, setting up an "umbrella" under which local services can operate etc. The TRBOT model is less than perfect but I'm not impressed by silly Toronto fear-mongering about some provincial bureaucrat picking the schedule for some local bus in Scarborough. That's not how these things work and the Steve Munros of the world will eventually have to realize that being the Centre of the Universe isn't the same as being the Totality of the Universe. Regionalism is inevitable and desirable - so long as it comes with true independence and accountability - unless we want to keep circling the same drain we've been heading down for the past 30 years or so. The devil is very much in the details. The TRBOT model is less than perfect but I'm not impressed by silly Toronto fear-mongering about some provincial bureaucrat picking the schedule for some local bus in Scarborough. We've all seen what happened to GO Transit in the 90s, how the province has gutted operational funding to transit providers across the region, and how the province has been consistently unable to follow through on their transit expansion commitments. It's not fear mongering. And I'm not as worried about some bureaucrat picking Scarborough bus schedules, as I am about QP deciding to slash transit funding by 30%, because of "common sense" or something. Riiiight. Except I just explicitly said a proper transit authority needs to be an independent agency that isn't beholden to Queen's Park, and which has its own funding. So it wouldn't be "the province," in charge at all. The Superlinx model does leave "the province" in charge but, as I also said, their model is flawed. Legally, I suspect any such organization would have to be created by the province - effectively through a new Metrolinx Act - but easy legislative changes would cut the chains that currently leaves "the province" in charge of Metrolinx's decisions and give them funding that isn't beholden to the government's annual budgeting. Pretty much no city that has a system we aspire to (New York, London, yada yada) has but a single system for the core municipality and certainly no one is traveling from abroad to study Toronto's system and de-amalgamating what they have because they've realized managing a single commutershed is a silly, obsolete idea. London is light years ahead of Toronto at this time. So is Paris, German cities, far eastern cities, Vienna, etc, etc. Jeezuz, even some South American cities are far ahead. Mind you, that's not difficult, Toronto is such a miasma of fiefdoms and political interference and gerrymandering. Can you imagine how much the province would cut TTC service if they uploaded it? Particularly under the current very right-wing Conservative government? You could kiss minimum 30-minute bus frequency from 6 AM to 1 AM goodbye for a start. Look at other parts of the GTA, where service is every 90-minutes on some routes. Or Halton Region, where they don't even have transit at all for some suburbs. I'm not sure those who approve such a thing, actually understand the implications! I think we're actually agreeing My point was that the head of TFL doesn't come to Toronto and go, "Gee - TTC operates totally separately from GO and YRT and Mississauga Transit? That's brilliant! We have to change the way we do things!" It's rather the opposite. We go to London and say, "Wow, they have everything under a single organization and have had a functional fare card for a decade and... Yeah, I like TTC and tokens and making sure no Queen's Park bully tells Toronto how to run its buses!" You're quite right that a model like TFL is several generations ahead of what we have. But there seem to be a lot of people here (I mean the GTA, not UT) who either don't understand that or who think we're an exception that doesn't need to aspire to transcending what you rightly call fiefdoms, interference etc. And this is PRECISELY, as if I'd written it myself, the sort of fearmongering I was speaking of above. There is no proof whatsoever this would happen, partly because you have no idea what "the province" would even look like, were they in charge of TTC government. Could a cynical government, like Ford's, seize control and do all sorts of terrible things, cutting routes that aren't "profitable" and such? Sure. But that's a debate about politics, not a debate about regional integration of transit service. There is nothing whatosever about a properly structured transit authority that is inherently threatening to Toronto, its interests, its local service etc. Indeed, in such a system the Premier and cabinet would have no say whatsoever. No one - at least not me! - is advocating for taking all the transit systems and putting them under control of the provincial government, per se. As someone in one of the suburbs that has invested in bus frequency I have similar concerns about this lowest common denominator approach that merger leaves us open to. I happen to like that my secondary bus route has 7-8 minute frequencies during peak times (never gets over 30 minutes in gaps and only then after 10 at night M-F....even the weekend service is pretty good).....when I compare that to similar routes in other suburbs I shudder at what would happen to it in a cost cutting measure. People complain about the fiefdoms and the different brands.....but they neglect to consider that if you combine it all then the service levels get homogenized....and not likely at the highest level of the group. My apologies, I re-read your post a number of times, and couldn't quite catch the intent. I was just reading up on TfL, and of course they, like many European and other nations, aren't federations, and there's really two levels of government: National and Municipal. The article is dated, but very informative. Any "Act" in the UK is from Parliament, not a 'state' or 'province'. But there again, the German cities almost all have comprehensive *regional* responsibilities, even under the 'Lander' (state) system. Any talk of improving any of Ontario's transit needs is forever tied in knots until we elect a provincial regime bent on change. Change to liberate progress, not to punish it. In the event, we've got an early start on the discussion when and if Ford et al do upload the subways.